Youngster Jarvis Hunt scored against MK Thunder. Phantoms head coach Slava Koulikov reckons his double-winners are also the top entertainers in NIHL Division One South. 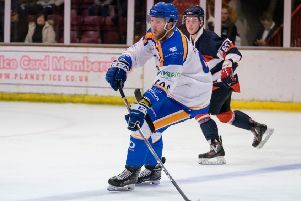 The city side have already lifted the NIHL Autumn Cup and NIHL South Cup during a memorable campaign which could still come complete with two further pieces of silverware. And they face a repeat of the showpiece in that latter competition when taking on Basingstoke in the semi-finals of the play-offs this weekend – first leg in Hampshire on Saturday (6.30pm) ahead of a Sunday return at Planet Ice (5.30pm). Phantoms pipped the Bison 6-5 on aggregate to lift the NIHL South Cup crown and Koulikov admits he would gratefully accept the same outcome again as his men attempt to advance to a final date against either champions Swindon or Bracknell the following weekend. “In my view we have been by far the most entertaining team in the league this season,” said Koulikov. “There are a lot of quality players and good teams at this level, but I feel we are the best team when judging on the elements of true hockey. “You only have to look at our execution, our puck management and movement, our transitions and some of the unbelievable powerplay goals we have scored. “I don’t see any other team in the league who are better than us when judging as a hockey man and not just as a fan. “We have been amazing to watch at times and we have all enjoyed our hockey. We just want to keep the season going for as long as possible and to do that we know we have to beat Basingstoke. “It’s very tough to predict what might happen in the play-offs, but everything we’ve seen this season suggests it will be very tight and I would happily settle for the same outcome as the cup final. Phantoms could hardly have started their play-off challenge any more impressively last weekend. The city men, who finished the regular season as runners-up, thumped second-bottom Milton Keynes Thunder 19-4 on aggregate. Phantoms took command of the tie with a 7-3 road win before roaring to a 12-1 triumph on home ice in the second leg. “We knew we had to start rolling from the first moment the puck dropped in the play-offs,” added Koulikov. “We couldn’t afford to play at 50 per-cent level just because we were facing the team who finished seventh in the table. “We showed the firepower we possess and the quality we have offensively, and we can now take that momentum into this very tough weekend which lies ahead. Another youngster – defenceman Bradley Bowering – missed out last weekend due to injury. He is expected to return for the semi-final.